We received these photos last week with an update of Juan. Juan is in an orphanage, but it is part of a larger SWI (social welfare institute). We found out that Juan is one of the few children that has an older couple from the SWI looking after her. This took place recently within the last two weeks. Prior to that she was solely taken care of by the orphanage staff. We are praying that the couple is stable and take good care of Juan. Please pray with us that she is safe and loved by this couple! Here's some more photos of Xiao Juan. Enjoy! "morning cuckoo bird" in Mandarin. I know, I know. Sort of funny, but in China apparently the cuckoo bird is the bird that ushers in the spring. So it has a good meaning over there. 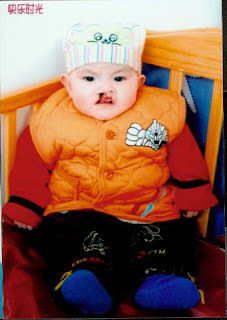 She lives in an orphanage in Qingyang, Gansu, China. Apparently not many children are referred out of that orphanage and I had a hard time finding much information on Qingyang. I found one posting on a yahoo group from a woman who had adopted a child from there. I contacted her and lo and behold she told me there was a yahoo group just for people who have adopted/are adopting from the Qingyang orphanage! I joined the group and what a wealth of information I have been able to glean already! So helpful! 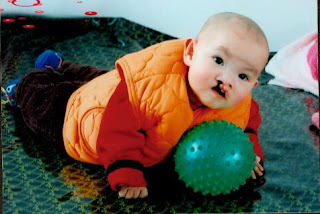 As you can see, Juan has cleft lip and palate. Well, you can't see the palate but it's there. Or... not there? (Okay, bad joke.) Totally correctable, although she will need surgery/ies, dental work, and definitely some speech therapy. God is so good though! 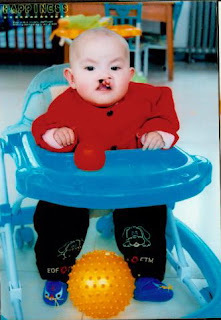 In addition to steering me to the yahoo group, (Many of the adopted children in that group have cleft l/p) He introduced us (through another set of adoptive parents) to a couple who adopted a little girl from China with cleft lip and palate just as severe as Juan's... and they live only 15 minutes away! Not to mention, I went to high school with the husband's brother! Too funny! Maps showing where Qingyang is, in the province of Gansu, China.